You're not gonna believe this, but here's another one of those hanging around on ebay. One of the members noticed it a few months ago, and it caused a big discussion. Everything fits to be the "unicorn", but some members finally just wrote it off as having its back cab panel replaced. Possibly after a wreck a LONG time ago. But I'm not so sure. The first one is of real interest. I have heard of these 50's with big back windows and 48-50 dash but I've never seen one. If you are headed back out there I sure would love to get more information, especially the firewall stamping. Great find. The first one has a 51/52 cab - or at least that dash. The trim line is clear around the radio area. The vin is missing a digit - it needs six of them after the prefix. I just noticed the dash trim and edited my post above. 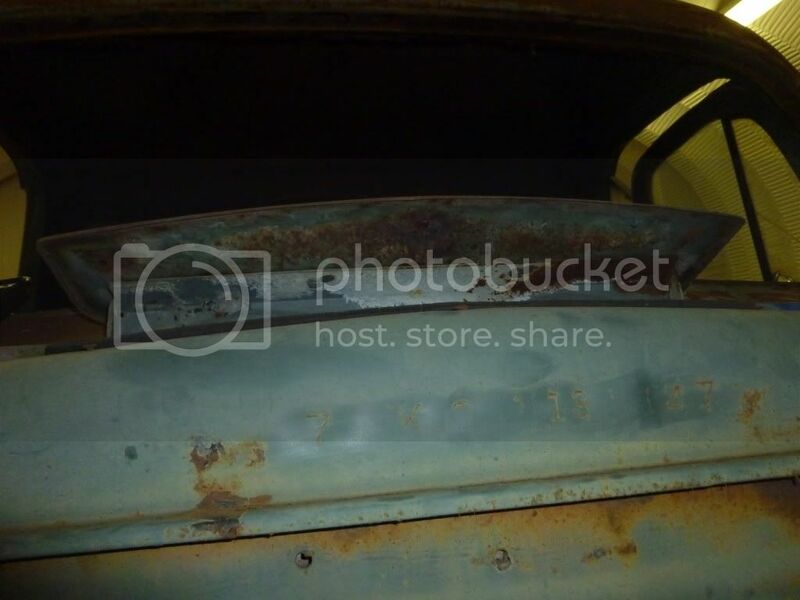 I also added a few pics and the last digit of the VIN on the 1st truck. I think you are right about the truck being pieced together. The two trucks came in to the yard from the same place and both are loaded with extra parts. First truck is likely a 51/52 with a 48-50 front clip and dash cut for the 48-50 cluster. Some PO likely pulled an old switcheroo with the data tags. Second truck is a 51 that was made in Richmond, CA. If it were me, I'd buy every useable piece from those trucks, within reason. Well I have been asked to share so here ya go. 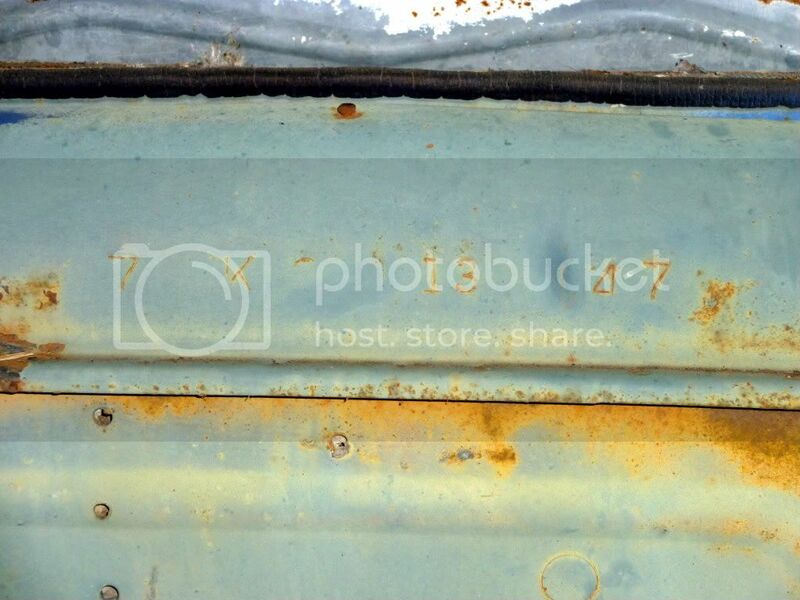 My truck is a 49 bought at a junkyard in Wamego KS, was on a rollback when I happened to see it. Bought it for 200 dollars. Biggest thing missing was the tailgate. The engine is siezed though. My Serial number is in the 203 range, as I have read thru this thread well within the 49 year for a 6 cly. 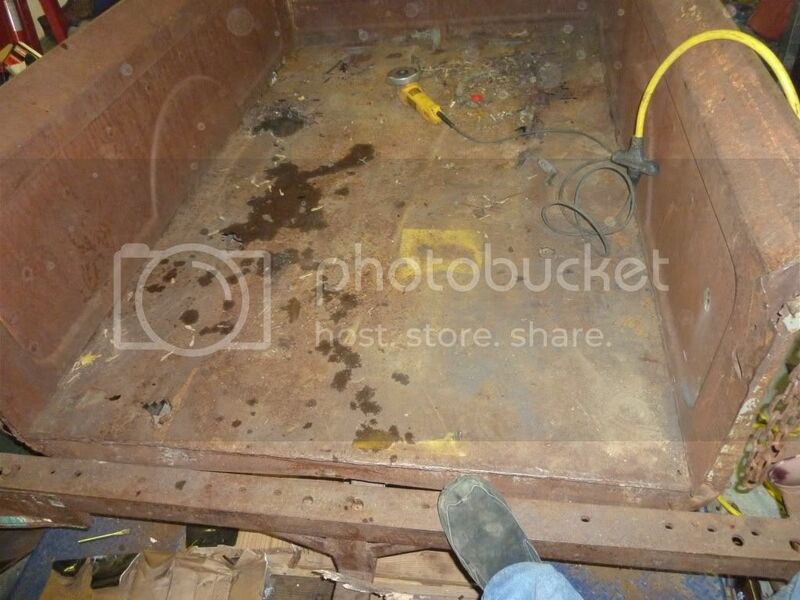 I do have the raised bed pannels, however something I have run across seems like most bed floors (the metal part) had ribs much like a modern pickup. Mine does not, but the bed floor appears factory. I have had one member state there bed was also flat like mine. I do not have the PS wiper (rubber plug) the PS visor has the metal punch out still intact, the serial number on the firewal and frame match, the plate on the glove box is gone. Small rear window, 4 on the floor. I know 3 of my rims are not stock, 2 are split rims, one has clips for a hub cap, one does not. So maybe none are stock, I have 16" rims on all 4. The tag on the diff (still there) says 3.73's. I had one tail light stock, believe the second added. Factory replacement light (not a Ford part but correct for the truck) the bracket however was a flat piece of steel. Rear bumper is custom, so believe not stock rear bumper. I have only the passenger side key lock. My wood bed was "keyed" can't remeber what it's called now, ran across one member who said his was pieces of pallets. An add on, my cowl vent is a two piece with 3 holes. Seems some were a two piece with no holes, some with, and some a flat piece if you will with a bracket. 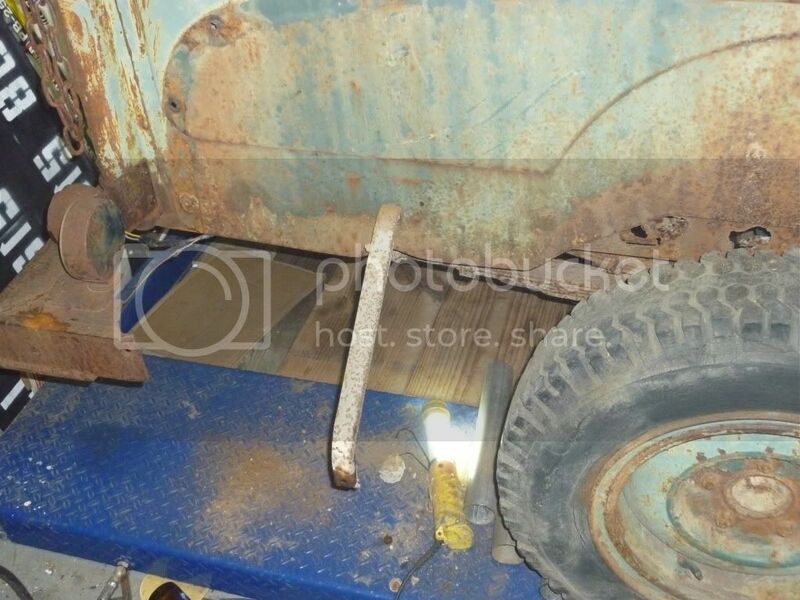 My front leaf springs seem to be stock in line with either 8 or 9 can't remeber now. The rear however have 11 or 12 on the bottom and another 6 in an overload pack so neither one of those should be stock. The axle is a F1 axle so I believe it would be factory, could have been swaped though. I had no radio, I don't believe I have the radio brackets, no antenna wire, or antenna hole in the body. Seems the standard trim had 4 clips to help hold the windshield in while the delux trim did not. My grill is painted suggesting a later 49 model. I cannot think of anything else that stands out now, had an add on spare tire carrier,and the rear bumper/hitch is welded into the frame. Going to be fun to cut out. Turn signals were added, expected. I believe I have vac wipers, really haven't looked, but I have run across the option of vac or elec, could be wrong though. I don't believe anything else was added to mine, other then the few add on's it appears 100& stock with excpetion of the rebuilt and sleeved engine which could be the factory engine. Here are a few pic's to include the firewall stampings. 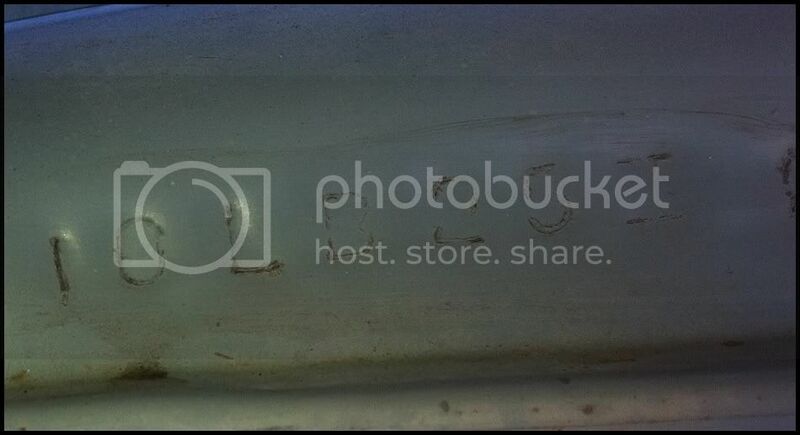 Hard to see but there are 3 holes in the cowl vent on mine, if you look close you can see one in the rust in the middle. I will have to look for the firewall stamping next time I am there. 49f-1, If I remeber the "cutoff" no one has a definate cutoff, but it has been narrowed down considerably. Yours should be a 1950. EAK, if you still have the origional battery tray I am pretty sure the 6 cly had the battery mounted on the drivers side like mine, and the V8 on the passenger side. That would be one clue. But yours would have been a 6 from the factory. 97HY decodes to 1949/50 226 6 cylinder F-3. Consecutive unit number in the 240,000 range should still be 1949, I believe. You'll have to find your firewall stampings to get any more details than that about your truck. It was mentioned that it appeared someone put a flathead v8 radiator in your truck, since is looks to have two water necks in the upper tank. V8's used two rad hoses top and bottom, where the 6 only had one each. The flathead 6 cylinder from 48-51 had the battery tray over the steering box on the left side. V-8's and the new OHV 6 in '52 had the battery on the right. The battery tray is on the drivers side - the guy who I got this from said it originally came with a 6, but as a few have pointed out - there probably was a V8 in there at one point, but regardless, there is nothing in there today!! I can't explain all of your cowl stamping, but as noted in the serial number you have a 1950 half ton six cyl produced at the Chicago assembly plant. Most Chicago plant trucks used a single number for paint color before the CH - such as 3CH or 7CH. I have one other truck noted like yours with the CHH beginning. CH would be for Chicago. Unless the H is for Palisade green, I don't know what it is. 1C I believe should be your paint code, but I don't have that decode info. 25X is more likely 25K, which would be your build date, October 25, 1949. 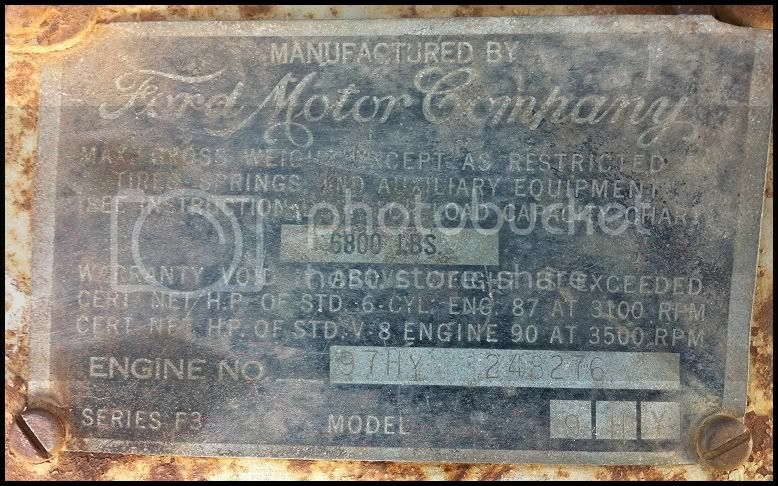 Here is the information on my 1950 F2 V8 4sp. I think this is the latest VIN that I have seen on this thread but I admit that I did not read all 21 pages. The frame and cab appear to match although the plates have obviously been reattached so who knows?!? The cab has a small rear window. It looks like the new Ford VIN plate was issued perhaps by a state DMV(?) as that is what appears on the title. I also found some interesting tags inside the seat back when I took it apart to be reupholstered.